Howard will arrive early in order to liaise with the banqueting team to conduct his pre- events checks. These will include seating plans, audio checks, raffle and charity auction arrangements, wine table, cloakrooms, meeting rooms, facilities for Top Table and Speaker Guests and much more. He will call the guests to take their seats in good time, introduce the Top Table, say Grace, and then work the tables to ensure that the guests are happy and that all their needs are being met. Howard will go on to introduce speakers, manage the toasts, run charitable auctions, collect in charity envelopes (encouraging the guest to maximise their contributions) and call raffles. These functions, both formal and informal, are made more enjoyable and progress more smoothly under the direction of a good Toastmaster either in 'reds' or in dinner jacket or lounge suit - which ever dress code suits the occasion. 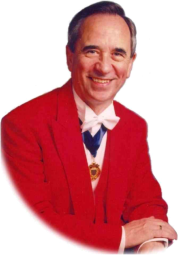 Let Howard ensure that whatever your function, the event runs smoothly allowing you to enjoy yourself in the knowledge that a professional Toastmaster and Master of Ceremonies is on hand to lift the burden from your shoulders.